Brampton Hardwood Floors | Low Price Flooring Store: When choosing between a solid hardwood floor or an engineered hardwood floor, one of the questions that we are often asked is whether or not an engineered hardwood floor can be sanded and refinished (the same way as solid hardwood flooring). This is an important consideration because refinishing basically adds an extra life to your floor. After some years, the floor’s finish can start to look dull (the protective sealant may even have worn down to the wood layer itself) and scratches become more and more prevalent. Sanding away this layer of wear and tear and refinishing your hardwood, brings the floor back to life, looking (for the most part) as beautiful as the day it was installed. The difference between engineered and solid hardwood, comes down to the construction of an engineered plank. 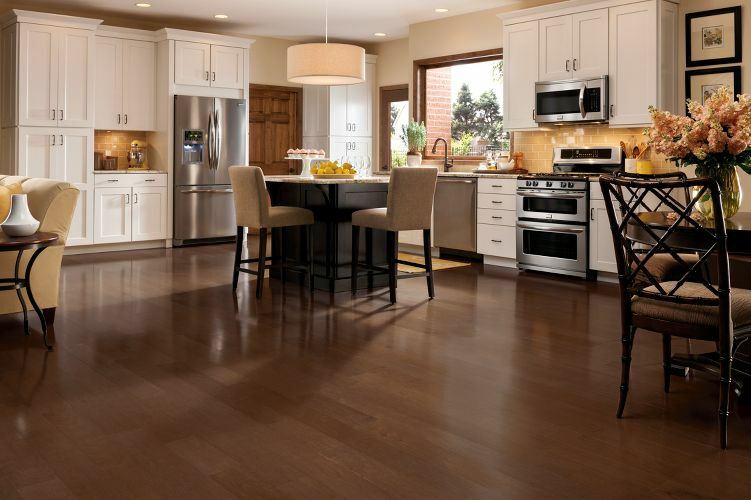 Very generally, engineered flooring is made up of a layer of solid hardwood adhered to layers of plywood. The layers of plywood give the plank greater stability which means less warping, shrinking, and/or expanding with environmental conditions of heat and humidity. For more information about engineered vs solid hardwood, read our blog post on this topic. When a wood floor is refinished, approximately 0.75 to 1 mm of the top layer of wood is sanded down. So as long as the hardwood layer is greater than 1 mm, the floor can be sanded. The thickness of this layer will determine how many times the floor can be refinished. Typically, the layer of hardwood in an engineered floor is between 2.0 mm and 10 mm, which means the floors can be refinished between 1 and 9 times, respectively. Depending on the level of activity the floors see, a floors finish should be good for around 20-25 years. Something to keep in mind however, is that if any planks have experienced cupping, sanding will remove more than 1 mm, to even it out. This can be a problem, based on how warped the floor board is and the thickness of the hardwood layer. It is also worth noting that if only one or two planks are damaged (deep scratches or dents), these boards can also be replaced. Removing and replacing boards is far easier and less expensive than refinishing an entire floor! For this reason, it is also a great idea to keep extra boards on hand for this purpose. The one downside to replacing planks, is that the colour and finish may not exactly match the worn planks around it. Questions? At Décor Floors, our expert staff can provide you with all the important information you need to know about the different types of flooring. Visit any of our three store locations in Toronto, Mississauga, and Bramptom to see samples and receive practical advice from any one of our knowledgeable flooring experts. Or, you can call us anytime, we will be pleased to help you as best we can!